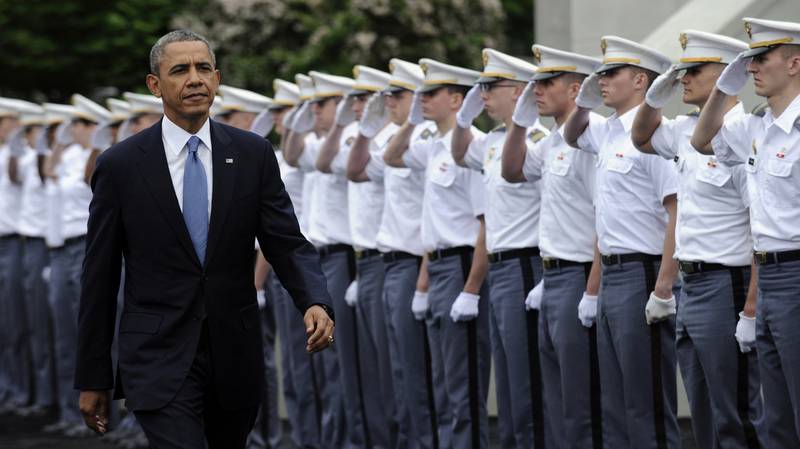 10 Thoughts On Obama's West Point Policy Address : It's All Politics From his focus on peace instead of war to his praise for the U.S. stance in Ukraine, the president took a different tone Wednesday than he did in his 2009 commencement speech at the military academy. In his commencement address to the Military Academy at West Point Wednesday, President Obama condemned isolationism but spent more time outlining the hazards of intervention. President Obama gave the graduation speech Wednesday at the U.S. Military Academy at West Point, using the occasion to describe "the next phase" of the U.S. war against terrorism and his ideas about national defense and foreign policy in general. Here are a few general impressions. Most commencement speakers try to mix in some humor and offer the graduating class some advice. But then, most speakers don't have the power to send those grads off to combat. This did afford the commander-in-chief a unique opportunity for an applause line, however: "You are the first class since 9/11 who may not be sent into combat in Iraq or Afghanistan." The cadets on the field before him smiled, while many of the family and friends sitting in Michie Stadium applauded and cheered. When President Obama spoke at West Point in December 2009, he was expanding the U.S. combat presence in Afghanistan (even as he decreased it in Iraq). He acknowledged that Wednesday, noting that four cadets whom he spoke to in 2009 have since died in "that effort" in Afghanistan, while many more were wounded. The president said he was "haunted" by those losses. The message had changed: This week, the president was telling the latest West Pointers to prepare to keep the peace, and to spearhead the "hard power" element in an array of economic and diplomatic tools. Continuing the metallic imagery, the president provided the day's most-likely sound bite with this cautionary analogy for policymakers: "Just because we have the best hammer does not mean that every problem is a nail." Advance notices of this speech had used words like "reset" and "vision statement" to describe the president's broader message on foreign policy. But aside from a commitment to spend $5 billion to train anti-terror forces in emerging countries, there was little new in the speech. Rather, the president reiterated the thinking behind a variety of White House responses to foreign challenges, from Syria to Iran to Ukraine. It was less a doctrine than a kind of discourse, a description of the attitude the administration has applied on a case-by-case basis. The president seemed to be reaching toward a reality he could not yet frame. At one point he borrowed John F. Kennedy's call for a peace based upon "a gradual evolution in human institutions." Obama added: "Evolving these institutions to meet the demands of today must be a critical part of American leadership." While much of the speech could be read as repudiating the wars of George W. Bush or of the Vietnam-era Lyndon B. Johnson, Obama did not mention these predecessors by name. He did mention Dwight D. Eisenhower, however, quoting words Ike uttered before he was president in an address to the West Point grads in 1947: "War is mankind's most tragic and stupid folly; to seek or advise its deliberate provocation is a black crime against all men." While he condemned "isolationism" and said, "America must always lead on the world stage," Obama seemed more intent on the hazards of intervention. Even given the recent goading from foreign antagonists, the president said: "U.S. military action cannot be the only, or even primary, component of our leadership in every instance." The president raised eyebrows by treating the recent events in Ukraine as a clear win for his measured approach. To date, the U.S. has responded to Russian moves in that former Soviet Republic by appealing to world opinion, imposing economic sanctions and rallying the NATO allies. Russia's Vladimir Putin has responded by seizing Crimea and menacing Eastern and Southern Ukraine. But on this day, Obama took the fresh election of a new pro-Western president of Ukraine as confirmation his own formula was working. The president surely knew he was not placating critics who find his foreign policy approach weak and irresolute, but he did offer one slightly hawkish signal on Syria. In his speech and in an interview with NPR's Steve Inskeep afterward, the president said the U.S. would do more than it's already doing to aid "more moderate" elements opposing the Assad regime. It is possible that in the weeks ahead, this shift will revive the controversy of last year over Obama's "red line" warning on chemical weapons. The president rotates his graduation speeches among the several service academies and would not be due back at West Point before the end of this term. It is possible, of course, that he would return to provide a bookend to his 2009 speech here, perhaps after the last of the U.S. forces leave Afghanistan.